Benedictine – A particularly random one this, arriving on my doorstep (an achievement when I live on the 6th floor of a flatblock with a door entry phone) in a padded envelope containing the mini and a brief sheet of paper from a PR company giving me a phone number to contact if I had any questions. 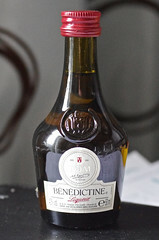 It’s sat on my random booze table for a couple of months, but I thought I’d crack it open as it seems wrong that I’d never tried Benedictine, especially as I picked quite so many bottles while helping in our warehouse this year at Christmas. It pours rather sticky and has a nose with lots of sugar syrup, sweet herbs, anis, ground spice (cinnamon, clove and ginger? ), sweetened black tea and some green bitterness. It tastes very sweet but with some savoury herbs and spice, especially tarragon and lots of cinnamon gobstopper fire, as well as clove oil, black tea and some bitter green herbs. It finishes sweet and grassy with more tea and a lingering cinnamon burn. From the nose I thought it would go along the sweet herbal note of Chartreuse but it’s much more focused around spicy cinnamon – one I will be experimenting with. Caol Ila Feis Ile 2012 – A bottle that I’m rather pleased to have, this – it was picked up during my very short time on Islay during the festival in 2012. Having spent a few days on Jura, with my only time on Islay being while we drove across the island to get the Port Askaig ferry, we were piling into cars to get back to Islay airport and fly home. Having heard that I’d not been to an Islay distillery Joel and Neil of Caskstrength bundled me into their Japanese Mercedes and stated that they’d get me back to the airport. Rather than drive straight there we took a brief detour to Caol Ila, where I was hurried into the shop, instructed to buy the Feis Ile bottling (thought by J&N to be one of the best festival bottlings that year, and particularly underappreciated), and then bundled back into the car before getting to the airport in time for my flight. Which was then cancelled, as every other flight that day was. Anyways, having tasted a sample of the whisky, courtesy of Jon from Living Room Whisky, to see if I wanted to open it, I took it along to the Christmas Whisky Squad ‘Bring a bottle’ session. As with previous years there won’t be a write-up of the session, this year due to the speed at which we tasted whisky which didn’t leave me time to write any notes, but I thought I’d give this another taste. Unlike most OB Caol Ila it was matured in sherry casks. On the nose there was sweet butter and spice, muddy peat, pine needles and sweet raisins, with floral notes around the edges and fragrant wood smoke. To taste it wasn’t as sweet as the nose suggested, with green leafy notes, bitter wood, some dried fruit richness, brine, mud and lots of sooty coal smoke. At 60.4% it could take a bit of water, which tempered the burn and released some florant hints, as well as more muddiness and a little bit of fruity sweetness. It finished with pine, damp wood and sweet butter, with floral notes developing along with lingering coal dust and a bit of mint with water. A bit of a punchy dram, which I needed to have a bit of a sit down after. A drop of water is definitely recommended and the sherry isn’t as pronounced as it was in this year’s unpeated special release, but is hiding down in the mix. One I need to go back to, maybe after a week or so of being open to let it settle down with a bit of air in the bottle. Agwa de Bolivia – Another bottle sent over from a nice PR company that I’ve not tried, although the colour alone means that it’s stuck in my memory. It’s a vivid green, towards the colour of green fluorescent markers. It’s a coca leaf and herb liqueur, using Bolivian coca leaves and produced in Amsterdam. 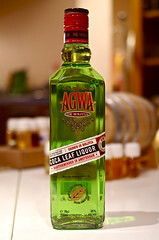 While the cocaine alkaloids are stripped from the leaves before production the location of the distillery and website of ‘agwabuzz.com‘ suggest that they might be playing on the reputation of the coca leaf somewhat. On the nose it is very evocative of its colour, with green grass, some floral meadow hints (chamomile?) and a bit of pot pourri and herbal hippy soap. It’s also got a hint of dentist surgery – pink antiseptic mouthwash. The taste is sweeter than the nose suggests, with more pink mouthwash and brown sugar syrup, before lots of black pepper, pine needles and crushed green leaves. It finishes with green chilli heat and turns slowly to very lingering lime, fitting as the cocktail on the bottle suggests chomping a wedge before doing a shot.